Barack Obama is sworn in as president, again, by Chief Justice John Roberts. WASHINGTON – After the flub heard around the world, President Barack Obama has taken the oath of office. Again. Chief Justice John Roberts delivered the oath to Obama on Wednesday night at the White House — a rare do-over. The surprise moment came in response to Tuesday's much-noticed stumble, when Roberts got the words of the oath a little off, which prompted Obama to do so, too. Don't worry, the White House says: Obama has still been president since noon on Inauguration Day. Nevertheless, Obama and Roberts went through the drill again out of what White House counsel Greg Craig called "an abundance of caution." This time, the scene was the White House Map Room in front of a small group of reporters, not the Capitol platform before the whole watching world. "We decided that because it was so much fun ...," Obama joked to reporters who followed press secretary Robert Gibbs into the room. No TV camera crews or news photographers were allowed in. A few of Obama's closest aides were there, along with a White House photographer. Roberts put on his black robe. "Are you ready to take the oath?" he said. "Yes, I am," Obama said. "And we're going to do it very slowly." 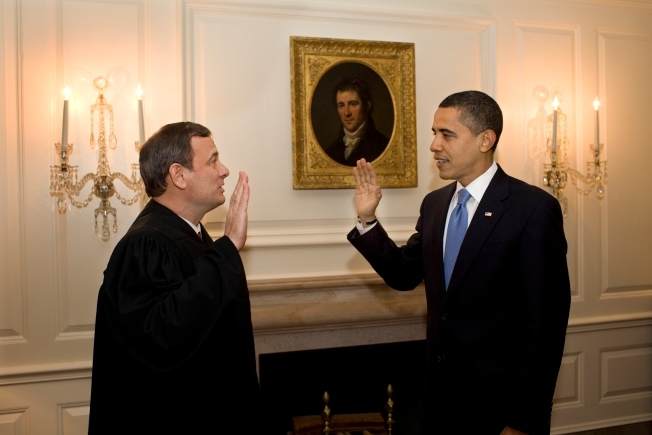 Roberts then led Obama through the oath without any missteps. The second attempt took 25 seconds to complete. The president said he did not have his Bible with him, but that the oath was binding anyway. He raised his right hand, and kept his left hand to his side. Michelle Obama was not present. The original, bungled version on Tuesday caught observers by surprise and then got replayed on cable news shows. It happened when Obama interrupted Roberts midway through the opening line, in which the president repeats his name and solemnly swears. Next in the oath is the phrase " ... that I will faithfully execute the office of president of the United States." But Roberts rearranged the order of the words, not saying "faithfully" until after "president of the United States." That appeared to throw Obama off. He stopped abruptly at the word "execute." Recognizing something was off, Roberts then repeated the phrase, putting "faithfully" in the right place but without repeating "execute." But Obama then repeated Roberts' original, incorrect version: "... the office of president of the United States faithfully." Craig, the White House lawyer, said in a statement Wednesday evening: "We believe the oath of office was administered effectively and that the president was sworn in appropriately yesterday. Yet the oath appears in the Constitution itself. And out of the abundance of caution, because there was one word out of sequence, Chief Justice John Roberts will administer the oath a second time." The Constitution is clear about the exact wording of the oath and as a result, some constitutional experts have said that a do-over probably wasn't necessary but also couldn't hurt. Two other previous presidents have repeated the oath because of similar issues, Calvin Coolidge and Chester A. Arthur. Associated Press writer Phil Elliott contributed to this report.